David Pinner, Ritual, Finders Keepers, 2011. The original seed from which grew the towering movie enigma The Wicker Man. "Shrouded in the same brand of mystery and contradiction that forms its tangled plot, Ritual, the 1967 debut by RADA-trained playwright David Pinner is commonly recognised by cult cinema fanatics as the original seed that grew into the towering movie enigma The Wicker Man. Four decades since it first hit the bookshelves, rediscover this true modern rarity and historical keystone in the well-trodden bridge between occult fiction and cinematic pop culture. Set against an enclosed rural Cornish landscape, Ritual follows the trail of English police officer, David Hanlin, who is requested to investigate the murder of a local child. During the protagonist's short stay, he is slowly subjected to a spectacle of psychological trickery, sexual seduction, ancient religious practices and nightmarish sacrificial rituals. All these fantastical ingredients were used for the cinematic rewrite by Anthony Schaffer who, along with Christopher Lee, obtained the film rights to Ritual six years after the novel's publication. Pinner's poetic and hallucinatory sequences were transformed into the rural celluloid folk story for Robin Hardy's 1973 film, The Wicker Man, which has enthralled and inspired generations of British movie patrons andfolk-pop enthusiasts throughout the world. 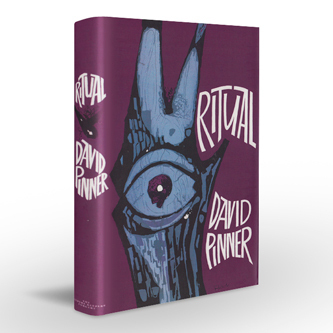 Original copies of Ritual's short print run have been known to command price tags as high as £600, rendering reading copies, in any form, to be virtually untraceable... until now. Finders Keepers debut print run sees Ritual painstakingly reproduced fromt he authors own personal copy, including its original striking wood-cut cover artwork and a new forward by The Guardian / The Times journalist and pop composer Bob Stanley." "Originally the plan was to film the book that the rights had been bought for, only for director Robin Hardy to change his mind and make something altogether different (and more serious) under the name of The Wicker Man, though both book and film share some similarities. Instead of being set in Scotland, Ritual is set in Cornwall, and the relatively remote locations for the two are used as a convincing and no doubt authentic backdrop for pagan activity. Both share a sexually repressed and puritanical Inspector investigating the murder/disappearance of a local girl, and the local communities both run circles around the Inspector (in Ritual his inability to see what is going on around him is served by his medical need to wear sunglasses at all times). They also feature a naked woman cavorting against a wall with the Inspector clutching desperately on the other side, and both at one point have the locals wearing animal masks. So the story has several elements that were carried on to The Wicker Man, but at the same time you can see why Hardy/Shaffer picked up the story and ran off in their own direction, tweaking it considerably into something else more cinematic and satisfying. The tone of the book has a jokey feel to it, as if the author is saying that he isn't taking it too seriously (he has said that his story was meant to be ironic), and the prose and dialogue is often flowery and downright odd. The Inspector is gradually driven insane by the locals and the twist ends with him murdering one of the children, with the explanation being that he suffers from sun madness bought on by his eye condition; he ends up sent to the madhouse; a chump all along. "David Pinner's Ritual opens in the English village of Thorn where the dead body of 8 year old Dian Spark is found by an oak tree. Suspicion is stirred by the fact she is holding a sprig of garlic and the press raise the question of a ritual killing. Enter Detective Inspector David Hanlin, a no nonsense police officer despatched from London to investigate the incident, and whose eyes remain almost permanently behind a pair of shades as he suffers from sun blindness. Hanlin begins with Reverend White at his church who insists the village is a Christian one, but David notices the altar cross is missing, to which the Reverend insists it often disappears and reappears again. However, the holy man is outraged when David finds a monkey's head and garlic flowers on the altar. Events cut to a seance being conducted by Dian's mother to ascertain if her child was murdered. Meanwhile, David is exploring the wood and is taken by Gypo, the local nutter, to the oak tree where Dian was found. The monkey's head is back, along with two bats pinned along side it. Back at the seance, Mrs. Spark claims there is witchcraft in the village and some of those present are involved. The accusation stirs up hysteria among the group, until the village squire takes control, suggesting the police should be brought in. Quite conveniently, he then makes the acquaintance of David Hanlin when Anna brings the detective back to the house to give him lodging. Hanlin initially spends his time visiting and getting to know the leading village characters. He visits Lawrence Cready, a rather camp character who had bought Squire Fenn's mansion, when Fenn had become debt ridden. Although Cready does have a witchcraft museum in his manor, he insists to David it is merely memorabilia. However, Hanlin discovers a doll falls with a pin stuck through its abdomen and the name Dian written across the back, when it falls out of the pocket of one of the local children, Fat Billy. The child goes hysterical, claiming he hated Dian and that her mother is a witch, but denies killing her. The boy is later found dead by the same oak tree. Events come to a head when Hanlin receives an invitation from Cready to be initiated in a moon worshipping ceremony the villagers are holding. He goes. The villagers are dressed as animals, including two march hares, while Cready is dragged up as a man-woman. The proceedings end up on the beach at a bonfire flanked by an altar of stones where a white horse is sacrificed. The whole thing appears becomes hysterical, setting off a chain of accusation and counter accusation, before Hanlin eventually struggles and discovers the identity of the killer in a twist that no one sees coming. If Ritual is famous for anything, it is as the novel Anthony Schaffer first considered for adaptation before deciding to do his own thing, which led to The Wicker Man. Ritual is very rich in its language. The problem is that, at times, this richness becomes over opulent in terms of dialogue. Virtually everyone in Thorn appears to be a budding poet or raconteur. The dialogue, at times, is amusing in its perversity ("Bullies always get their comeuppance! St. Valentine's Day is always hanging around some old garage! "), sometimes distracting ("You shouldn't gallop about in Gods house, you know!...God usually has his midday hibernation approximately now. He has to work very hard! "), often unbelievable in its absurdity ( "Who would dare, during my angelical reign, who would dare place a shrunken anthropoid's head on my high altar! This is really removing Lucifer's trousers."). It is difficult to judge whether Pinner simply got carried away or is deliberately having a laugh, given that the writer himself has stated Ritual to be "blackly, ironically humorous". Pinner's characters are interesting. David Hanlin is a trickster, a man who is not always what he appears to be. He hides his eyes behind sunglasses, though is more for medical reasons than shielding himself from others. Throughout the book, Hanlin tells lies in order to further investigation, yet keeps telling himself he does not like lying; a symptom/prefiguring of his split personality perhaps? The supporting characters resemble a Hammer horror rep of the day, missing only the "arr, ye be stranger around here." Lawrence Cready, the main protagonist, is a wonderfully repulsive old queen of a man and is the containment of the only supernatural element of Ritual. Mrs.Spark, the murdered girl's mother, rebounds between grieving desperation and hysteria. Anna Spark is not unlike Willow in The Wicker Man; a sexual temptress. Like language, Ritual is enriched in imagery, though not as over opulent. The novel opens with a butterfly - a symbol of metamorphosis - fluttering around the murdered Dian. Pinner plants the suggestion that the insect is Dian transformed, floating around her own dead body like a freed spirit. This is reinforced later when the butterfly lands on her Mrs. Spark's breast during the seance, the child returning to the source of maternal comfort. The insect is subsequently killed by Fat Billy. He is later accused of killing Dian, which he denies but admits he wanted to kill her. Maybe he did in killing the butterfly.